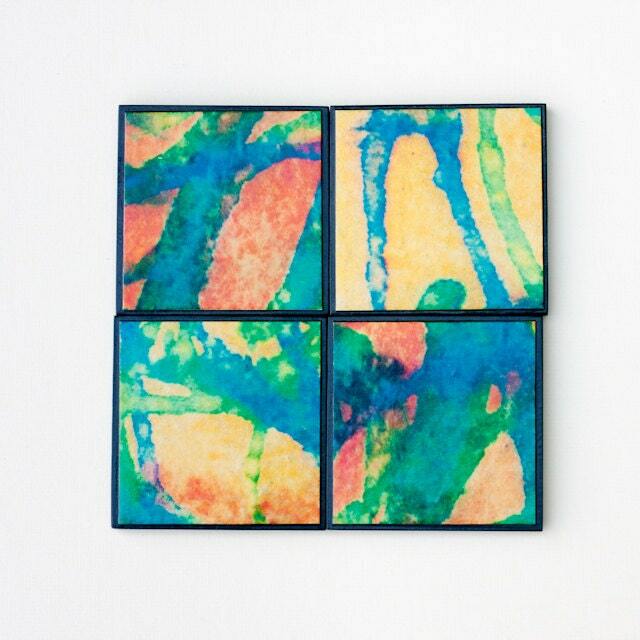 These handmade paper coasters are photos of my paper printed on a piece of my 100% recycled handmade paper. I take photos of my painted papers because some I really love and don't want forget them and also they give me inspirations and ideas for other sheets. The set of 4 are 4"x4" and the base is 1/4" hardboard. Coating the paper design are several layers of polyurethane for durability and water resistance. These coasters are not intended for extremely hot items. Clean with a damp cloth. Cork is applied on the bottom to protect table surfaces.